TEHRAN, Iran — Iran's president said Thursday the Islamic Republic soon will send two new satellites into orbit using Iran-made rockets, despite U.S. concern the launch could help further develop its ballistic missiles. President Hassan Rouhani's comments, during a commemoration for the late President Akbar Hashemi Rafsanjani, confirmed the rocket launches would take place. Iran typically displays achievements in its space program in February, during the anniversary of the 1979 Islamic Revolution. This year will mark the 40th anniversary of the revolution, which saw the Persian monarchy of Shah Mohammad Reza Pahlavi replaced by the Islamic Republic overseen by a Shiite cleric. "Soon, in the coming weeks, we will send two satellites into space using our domestically-made rockets," Rouhani said, without elaborating. Previously, Iran has sent several short-lived satellites into orbit over the past decade, and in 2013 launched a monkey into space. The U.S. and its allies worry the same satellite-launching technology could be used to develop long-range missiles. Last week Iran said country's three new satellites have successfully passed pre-launch tests. Meanwhile Thursday, Iran began an annual air drill in central parts of the country. The state-run IRNA news agency said dozens of fighter jets, bombers and transportation planes are taking part in the 2-day maneuver. It said beside U.S.-made F-14, F-5 and F-4 fighter jets of the shah's era, the Russian-made MiG-29 fighter jet as well as the Iranian -made Saegheh fighter will participate in the annual war game. Drones, laser-guided rockets and heavy smart bombs also will be used, said Gen. Amir Angizeh, the maneuver's spokesman. Pompeo is currently touring the Mideast to promote the White House's tough stance on Iran and to assure America's Arab allies that the Trump administration is not walking away from the region. 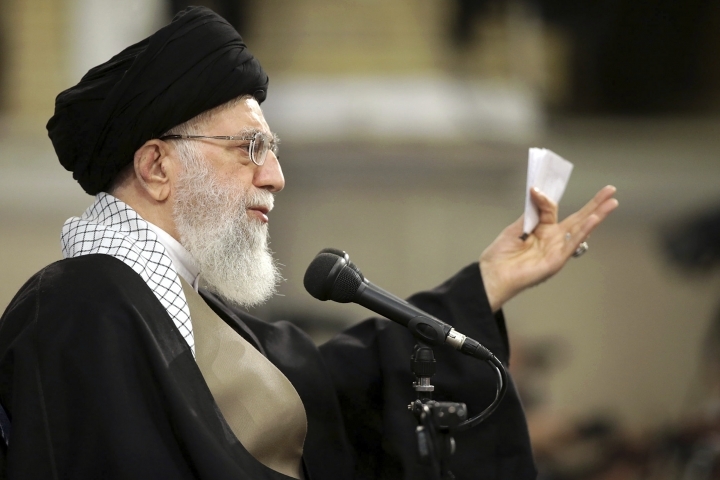 On Wednesday, Iran's supreme leader, Ayatollah Ali Khamenei, called Washington officials "first-class idiots" in unusually harsh remarks that reflect the broader tension between Iran and the U.S. after President Donald Trump withdrew America from Tehran's nuclear deal with world powers.